God knows us entirely, and I believe that what we know of ourselves is what God has revealed to us when we have been ready to listen to God’s voice. We have all had those ‘a-ha’ moments where we all at once saw the world as we had not seen it before. Those moments where we tuned in to what is happening within us in response to outside forces around us. So it becomes important for us to ask God to guide us to a deep sense of self and to ask God to teach us how that sense of self relates to those around us. Wendy Evans, a marketing guru writes about the need to find a sense of self-awareness. “Self-understanding is fundamental to success/relationship. It requires an honesty, which acknowledges our imperfections and an understanding that we have developed definite preferences and prejudices about life. Having imperfections, preferences and prejudices is all part of being human. But it is the failure to recognize the influence they have on our everyday decisions and actions which hinders our progress [with others].” – parenthesis are mine. We are far to quick to allow outside forces to define our joy and our sorrow, our failures and our successes, our victories and our defeats. 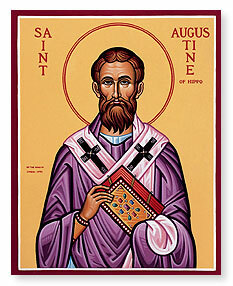 On this Feast day of St. Augustine of Hippo, we pray to become more aware of who we are. We ask God to for illumination and revelation. May we be less ignorant of our own preferences and prejudices and more aware of who and whose we are – God’s beloved!